Shoshauna Shy is the author of two chapbooks, Souped-Up on the Must-Drive Syndrome (Pudding House Publications) and Slide Into Light: Poems of the Brighter Moments (Moon Journal Press). 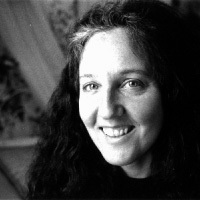 Her work has appeared in Poetry Northwest, Cimarron Review, Slipstream, New Millennium Writings, and on Poetry Daily. One of her poems was selected for inclusion in the Library of Congress program, “A Poem a Day for American High Schools” launched by Billy Collins. She lives in Madison, Wisconsin. I was drawn to the title of this poem, I wondered what I might find for information.silly focus on the woman’s clothing during this horrific life event. I was drawn to the title of this poem, I wondered what I might find for information.I was surprised to see the seemingly silly focus on the woman’s clothing during this horrific life event. But yet, I then thought about times in my own life where something important might be going on yet I catch myself thinking about the most unimportant things. Perhaps this is human nature in that at a point where we have no control maybe it is safest to let our minds ponder the tiniest details to keep our minds in tack. Do you have any comments, criticism, paraphrasis or analysis of this poem that you feel would assist other visitors in understanding the meaning or the theme of this poem by Shoshauna Shy better? If accepted, your analysis will be added to this page of American Poems. Together we can build a wealth of information, but it will take some discipline and determination.